Sewn With Grace: Oh no I didn't - Oh yes I did! Oh no I didn't - Oh yes I did! Ever have a moment when you feel like the dumbest person on the planet? Remember this sweater I embellished a while back? It somehow got thrown in the wash.
You have the lovely photo and the memories of how special you felt in that jacket. No words are going to make you feel better, but my Chrisitan sister - in the bigger picture, it's only clothes! Noooo! 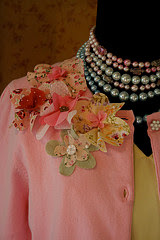 I love tht sweater, pinned it and have been keeping my eyes on the racks for something similar to embellish for Spring. Ah well, at least you know you can make another right? I have a blouse I embellished to match a skirt, and it got totally ruined in the wash too. :( I've ruined a few things that way myself. Oh no . . . . so sorry to hear that. Well, things like that happen around here too. Usually also related to bleach like Koralee said. Now you need to find a new sweater and try making a new one! Oh no! :/ It's just sooo pretty! These things just sometimes happend sounds like we've all had our moments...lol. Oh, no! Maybe you can make another one? It was beautiful! At least you can design another one. Oh no not your beautiful sweater! So sorry. Maybe the next one you create will be even better. Oh no, Renee, you didn't. I am so sorry. It was so pretty. You will have to find another to embelish. You might even come up with something you like better. I'm so sorry. Hate it when things like that happen. The sweater was so pretty. Very sad, about 15 years ago, I thrifted a hand knit yellow cardigan. So many people commented on how lovely it wat the first (and last) time I wore it. I washed it, and it must have been something special, because it shrunk to a tiny little nothing. I was sad.